The elapsed year of 2015 turned out to be quite eventful for ARQA Technologies in terms of various projects and developments that involved it as a technology vendor, expert, consultant and partner. Over the past year 9 banks and investment companies became our QUIK clients, while 5 investment companies implemented our backQORT solutions. ARQA Technologies’ testing grounds were intensively employed in strenuous testing of sophisticated solutions based on QUIK as well as QORT products. By the year end we have completed moving 13 of our clients from the Siberian data center in Novosibirsk to the M10 data center of RTCom in Moscow, the latter being the principal data center of ARQA Technologies. In 2015 the software complex QUIK acquired a number of additional server modules. The line of trading interfaces got new direct trading interfaces to international venues. The trading interface Eurex delivers market data and allows trading on futures and options market of Eurex — a global venue for derivatives that is controlled by Deutsche Börse AG. The trading interface CME connects the EMS QUIK server to the CME Globex trading platform — a global system of electronic trading for futures and options at the markets of CME Group. Through Turquoise trading interface users get access to Turquoise, the pan-European MTF majority owned by London Stock Exchange Group for trading a wide range of securities comprising more than 4000 stocks, depositary receipts, and ETFs admitted to trading from developed and developing markets of the European Union, Norway, Switzerland, and the USA. Further developed was the line of RISQ solution interfaces that comprises a range of solutions for pre-trade control of operations featuring broad functionality of risk minimization and pre-adapted to varied types of low-latency infrastructure. For spot market of LSE we developed yet another direct trading interface (aka sponsored access). FIX2LSE for Linux enables trading operations from external platforms with simultaneous online risk control of such operations on the QUIK server. It works so that transactions from that trading platform are forwarded directly intothe exchange trading system bypassing the QUIK server. This low-latency solution was built on the basis of the Linux operating system (RedHat6) which accommodates latest network technologies for highly efficient signal transmission. The line of QUIK KillSwitch solutions acquired additional ones for stock and FX markets of Moscow Exchange. This product line provides online risk control for broker clients’ sponsored access to exchange trading through the use of exchange technology of Kill Switch for termination of client trading at risk parameter violation. In 2015 the company paid a lot of attention to developing and implementing QUIK solutions for building and optimizing complex trading infrastructures. This applies primarily to FX Dealing (broker-bank clients’ access to FX instruments) and QUIK-OMS (client order execution and automation of interactions between clients, sales managers and traders). As these types of solutions are not universal and are shaped to fit tasks of a particular broker via several QUIK server’s interconnected modules, in each case representatives of ARQA Technologies engage in profound consultation which may also involve customization. 2015 saw the release of a number of new versions of user terminals: QUIK Workstation, web-application webQUIK, mobile applications iQUIK, iQUIK-HD and QUIK Android. Beside functional improvements all changed versions of QUIK workstation feature improved ergonomics of the trading terminal. The terminal’s interface has a new menu which is more compact and intuitively understandable. Tabs are now easier to work with, there are new search capabilities, optimized graph building, etc. In addition to that users may easily adapt the interface to their needs. Changes in interface ergonomics are also visible in the new version of webQUIK user workstation that got improvements in the terminal usability. Thus, webQUIK users are offered options already in the authorization window — they have a choice of two available profiles (for layout settings, window and bookmark structure) and of two desktop themes (‘light’ and ‘dark’). The authorization window also has a webQUIK server access indicator. The new version of web application makes it more convenient to use tabs, set the blotter and build graphs. The principal trend of 2015 in development of QUIK user applications for mobile devices was ever closer approximation of their capabilities to fully functional desktop applications of QUIK. ARQA Technologies has been regularly consulting its clients over a wide range of issues concerning efficiency of its solutions application. Having accumulated years of expertise in the field the company offered its clients services of QUIK complex audit. The audit of QUIK trading infrastructure checks it for compatibility to changing requirements of business, exchanges, new technology and other variables. The audit embraces analyses of composition and settings of QUIK software, exchange gateways, server equipment, system software, communication channels, testing and maintenance procedures. Business-audit of QUIK complex evaluates how efficiently the current QUIK platform resolves vital business tasks. For this purpose the audit includes the analysis of all component settings responsible for the business logic. The main event concerning the product line based on QORT platform of ARQA Technologies was the release of its new software product — middle office of asset manager capQORT. This software complex makes it possible to consolidate and keep position over all asset manager’s operations, work with portfolios and groups of portfolios, control various restrictions and detect violations. Trading operations are conducted through several brokers from a single capQORT workstation. In its final stage is also capQORT’s integration with the RU DATA data base (a joint project of NSD and Interfax) which allows uploading data on issuers, bonds, Eurobonds, coupons to the middle-office of asset manager. In 2015 QORT released several new supplementary modules: VaR-analysis module which allows assessing a probable loss for an asset or portfolio that may result from market risk and FIX –integration module that serves for integration with external software platforms. The above-mentioned modules are available for all principal solutions which are based on QORT software: midQORT, capQORT, backQORT. The QORT line is also offering an opportunity for generating a copy of retrospective reports. The said copy is not to be connected to trading or other systems on a regular basis but this software is regularly updated so that its database may be used to generate retrospective reports as required by the regulator. In 2015 ARQA Technologies continued its regular participation in leading international and Russian technology forums, exhibitions and conferences such as EMEA Trading Conference (London), Investfunds Forum, organized by Cbonds-Congress (St-Petersburg), INFINTECH Conference & Exhibition (Stambul), IDX 2015 (London), the First Kasan forum of innovative financial technologies (Kazan), All banking automation 2015 (Moscow), NAUFOR conference (Ekaterinburg), Thomson Reuters conference (Moscow), ExTENT-2015 (St-Petersburg). Last year ARQA Technologies acted as the technology partner of the competition ‘I investor’ initiated by Moscow Exchange and thus provided its front-office platform QUIK free to participants for the purposes of the competition. 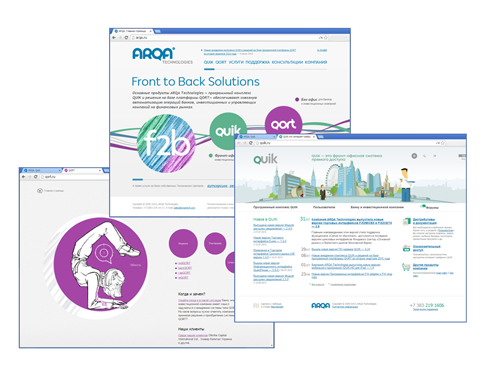 In 2015 ARQA Technologies launched its new corporate website — www.arqatech.com, which combines information on the company, its products and services. Simultaneously with the website launch the company has completed transition to its new corporate style.